A little three year old boy is sitting on the toilet. His mother thinks he has been in there too long, so she goes in to see what’s up. The little boy is sitting on the toilet reading a book. But about every 10 seconds or so he puts the book down, grips onto to the toilet seat with his left hand and hits himself on top of the head with his right hand. What would i do without emails! This entry was posted in humour on August 20, 2009 by Grannymar. I’ve been pathetic with funny emails lately. So if you have any good ones, forward them on. 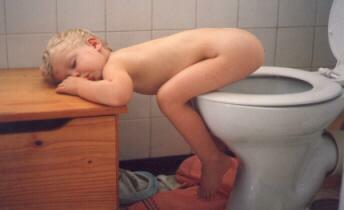 My son actually did fall asleep on the loo once. Picked him up, cleaned him off, popped him into bed without him even waking up. And that was only last week. He’s 22. Don’t tell him I told you, he’ll die a slow death. It may work for ketchup, but usually too much comes out and there’s mess everywhere…. @Baino – he will always be your baby! @Rhyleysgranny – Glad you have your elephant table. I seem to have revived the interest in them. Will you add a background story to it? This reminds me of the time that I almost got arrested in South Africa for “peeing” in public. (Back in the “70’s) if you were black it was okay to do that, but if you were white—no way! Moral of this story— grin and bare and keep ypur legs crossed until you find a bathroom that is not locked. “A German inventor named Alex Benkhardt has created a devise designed to shame men with bad aim into sitting down to pee. The device, called the WCGhost, attaches to a toilet seat. Every time the seat is lifted, a stern female voice says, “Hello, what are you up to then? Put the seat back down right away, you are definitely not to pee standing up–you will make a right mess.” as of mid–2004 Benkhardt had sold more than 1.6 million of the devices in Germany, and plans to expand into Italy, Canada, and England.” Ladies keep your towels handy, because nothing was mentioned about expanding the device to Ireland. US, New Zealand, or India. BUMMER! @Maynard – Thankfully I am not troubled by any of the above. I tried the ketchup trick and it worked!!!!!!! Grannymar, you are right–let’s keep Rummy’s mess out of this conversation!